South Korea offers a wide variety of accommodation options for travelers. There are at least a few hostels in most popular destinations, but you won't find the large selection of hostels that you see elsewhere in Asia. You can also expect to pay about twice as much for accommodation in Seoul as you would elsewhere in the country. In addition to hostels and guesthouses, there are hotels, motels (comparable to Japan's "love hotels"), and minbak. Minbak are found mostly in rural areas or near national parks. They can be anything from a basic room in a house to a nicer hotel, but guests typically use shared bathrooms. These areas are popular with backpackers and young travelers because they make up the University Quarter. This is where you'll find Ewha Womans University in Sinchon and Hongik University in Hongdae. The area has a lot of shops, restaurants, and bars that cater to a younger crowd. If you're looking for fun nightlife, then this area is a good option. Jongno-Gu is near many of the city's most historic neighborhoods. This area has a fascinating history and plenty of sights that are worth visiting. Itaewon is a popular international district with a lot of international restaurants and shops. There's also a lively party scene that attracts an eclectic crowd. Myeongdong is one of the more popular areas for tourists in Seoul. The neighborhood has excellent shopping malls, great restaurants, and a vibrant nightlife scene. If you want to be near all of the action, then this neighborhood is a good option. Gangnam is a business district in Seoul, but it also has plenty of shops, bars, and restaurants around. This is an upscale area with some of the city's most expensive hotels, but there are a few cheaper options around as well. If you want to be near the best malls and shopping centers, then Dongdaemun is a good area. The area has all kinds of shops, and it is particularly famous for its late night shopping. Yeouido is another office area in Seoul, but it also has the peaceful Yeouido Hangang Park, if you want a change of scenery from the busy city. Where Do Backpackers Stay in Busan? Seomyeon is really where all of the action is. It's central location and easy accessibility to transportation make it a great base for exploring the city. There's a large number of restaurants, cafes, and bars in the area, so whether you're looking for nightlife or tourist attractions, everything is convenient. The biggest disadvantage of this area is its distance from the beach, so if you're planning to hang out by the water a lot, you'd do better to stay near one of the beaches. Haeundae Beach is on of the most popular beaches in South Korea. If you want to spend time relaxing on the sandy shore, then this is the place to stay. There are also many restaurants, shops, and entertainment venues in the area. Accommodation if plentiful, but prices can be a bit high. If you're on a budget, there are some affordable places sprinkled between the higher end hotels, but most budget travelers head to Gwangalli Beach instead. Gwangan is a lot like Haeundae Beach, but it's more relaxed and closer to other attractions. There's delicious food, excellent shopping, and even a bridge that lights up at night. This area is a bit more affordable than Haeundae Beach, and it's popular with backpackers and long term travelers. Kyungsung has a great party vibe without the beaches. This university area has a great nightlife scene with a wide variety of bars and restaurants. There is also plenty of great shopping in the neighborhood. This is one of the best shopping districts in the city. There's everything from luxury malls to discount shops. Even if shopping isn't your thing, it's worth wandering around for the experience and the street food. Taejongdae is also nearby, which is a nice park in the area. Where Do Backpackers Stay on Jeju Island? Jeju City has a few attractions, but most visitors who stay here use it as a base for exploring nearby areas. There are a variety of beaches that are just a bus ride away. Seogwipo is a quaint town on the southern side of Jeju Island. The area has a few waterfolls and there are a variety of water activities available as well. Eastern Jeju is a beautiful part of the island with small fishing villages and a traditional vibe. There are buses that travel here from Jeju City and Seongsan is one of the nicest villages to visit. The island of Udo is also worth a visit. Most visitors come to Jungmun for its high end resort, which attracts business travelers and luxury vacationers. There are still activities in the area that appeal to everyone, including temples, museums, and natural beauty. 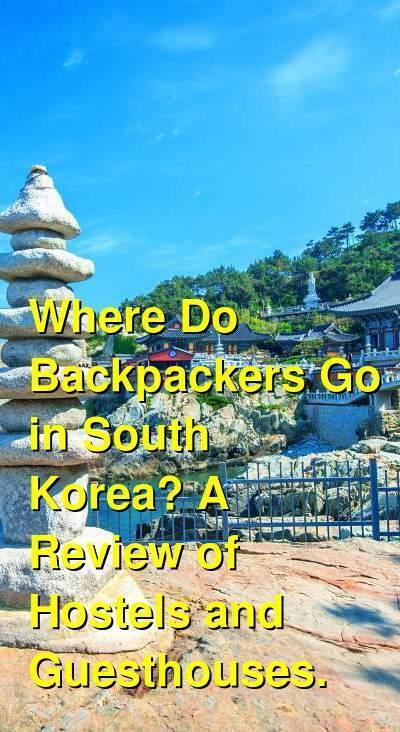 Where Do Backpackers Stay in Gyeongju? There are a variety of accommodation options in Gyeong-ju. The cheapest places are near the train station. These options are very basic and often aren't very clean. If you're willing to spend more and want a bit of luxury, there are high end resorts in the Bomun Lake Resort Area. Where Do Backpackers Stay in Sokcho? Sokcho is near Seoraksan National Park and it's about an hour by bus from the DMZ.